The Toronto Maple Leafs travel to Joe Louis Arena to play the Detroit Red Wings on Saturday, April 1, 2017. The opening line for this game has the Maple Leafs at -135 and the Red Wings at +122. The over/under has been set at 5.5. Toronto comes into this matchup having played 76 games. They have an overall record of 37-24-15 and on the road they have a record of 17-14-8. Currently they are 3rd in the Atlantic Division. They've scored 233 goals and given up 222 goals for a point differential of +11. The Maple Leafs have an overall record of 7-2-1 in their last 10 games. For the season they have an ATS record of 36-39 and an over/under record of 34-38-4. Detroit shows up with a record of 31-34-12 including 15-16-6 at home this season. They are 8th in the Atlantic Division. They've scored 192 goals and surrendered 229 for a goal differential of -37. The Red Wings have a record of 5-4-1 in their last 10 contests. Their record against the spread is 23-46 while their over/under record sits at 34-34-9. Auston Matthews has accumulated 63 total points this season for the Maple Leafs. He has 36 goals this season with 256 shots on goal giving him a shooting percentage of 14%. He has a total of 27 assists on the season and averages 17.7 minutes played per game. Nazem Kadri has averaged 16.6 minutes of ice time per game this year. In that time he has a shooting percentage of 14% by scoring 30 goals on 222 shots. He has 27 assists giving him a total of 57 points on the season. Frederik Andersen has 31 wins and 15 losses this season in net for the Maple Leafs. He has had 1,954 shots against him and has given up 158 goals. He has made 1,796 saves for a save percentage of 92%. 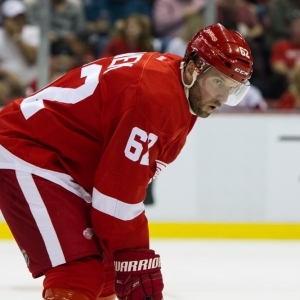 Thomas Vanek has accumulated 46 total points this season for the Red Wings. He has 16 goals this season with 123 shots on goal giving him a shooting percentage of 13%. He has a total of 30 assists on the season and averages 14.5 minutes played per game. Henrik Zetterberg has averaged 19.7 minutes of ice time per game. In that time he has a shooting percentage of 9% by scoring 16 goals on 177 shots. He has 48 assists giving him a total of 64 points on the season. Petr Mrazek has 17 wins and 21 losses this season in net for the Red Wings. He has had 1,387 shots against him and has given up 138 goals. He has made 1,249 saves for a save percentage of 90%. The Maple Leafs have 89 total points this season. They have scored 233 goals while giving up 222 goals. They have had 226 power play opportunities and have scored 53 goals on those chances for a percentage of 23%. The Maple Leafs have allowed 238 power play opportunities and given up 41 goals on those chances for a penalty kill percentage of 83%. They average 32 shots per game and as a team are shooting 9.60% for the season to this point. They allow 33 shots to their opposition per contest and have a team save percentage of 91%. The Red Wings have a total of 74 points on the season. They have 35 power play goals on 243 opportunities thus far for a percentage of 14%. They have allowed 225 power play opportunities and have given up 42 goals on those chances for a penalty kill percentage of 81%. As a team, the Maple Leafs have a total of 192 goals scored while they've given up 229 goals to this point. They average 28 shots per contest and have a team shooting percentage of 8.83%. As a team they give up 31 shots per game and have a save percentage of 90%. Toronto has a Corsi percentage of 49.8% as they've attempted 4,608 shots on net at full strength while they've given up 4,646 shots on net in the same situations. Their Fenwick percentage is at 49.5% as they have 3,472 attempts while they've given up 3,538 shots on the defensive end. The Maple Leafs start possessions in the offensive zone 50% of the time while their defensive zone percentage is at 50% for the season. They have 2,315 face off wins compared to 2,357 losses, meaning their faceoff win percentage is 49.6%. On defense Toronto has 1,815 hits and they've blocked 1,108 shots from the opposition. Detroit has attempted 4,025 shots at full strength and they've given up 4,270 attempts, meaning their Corsi percentage is at 48.5% for the season. In terms of Fenwick percentage, they currently are at 48.3% as they have 3,068 shots while they've given up 3,279 attempts on defense. The Red Wings have an offensive zone percentage of 52.2% and their defensive zone percentage is 47.8% so far this season. They have a faceoff win percentage of 51.8% as they've compiled 2,370 face off wins this season and they have suffered 2,203 face off losses. On defense Detroit has blocked 991 shot attempts and they have 1,534 hits as a unit. Who will win tonight's Maple Leafs/Red Wings NHL game against the spread?